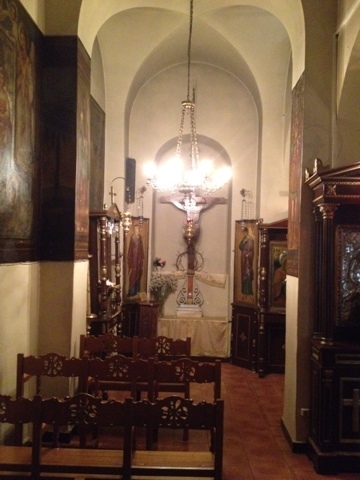 Yesterday I visited the Church of the Dormition just outside the door of my apartment, and Alexandros invited me to their service Sunday night at 8:30. I thought that this must be a vigil for the feast of the Holy Spirit (celebrated the Monday after Pentecost). I was partially correct. Before I continue, let me set the stage: This church has a very different feel than St. Irene's. St. Irene's is perfect. The services are sung with the best Byzantine chant in the world, the marble floors and walls create perfect acoustics, the priest and deacon serve with precision. Everything is done with splendor, grandeur, and magnificence. I arrived at Panagia Rombes just before 8:30, and the tiny church was already packed, women on the larger, left side, and men on the right. 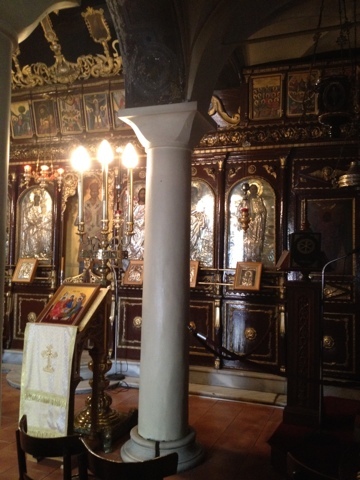 A man was reading the Akathist hymn at the front of the church, before one of the icons of the Panagia. 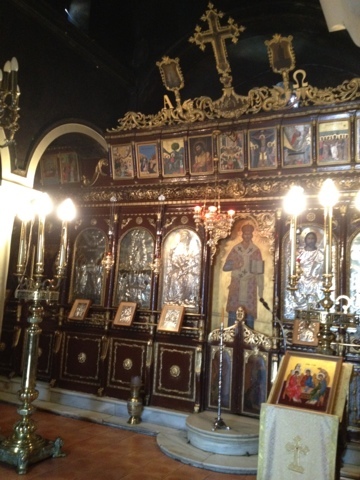 The nave was full of yiayias quietly whispering along the entire akathist by heart. Everyone was very prayerful and attentive, and many had a prayer rope. The akathist was concluded and the priest brought out a bowl of oil with a lamp, followed by a bowl with seven candles. "Oh, Holy Unction. That's why they said the service would go until 12:30." But wait, there's more. The first thing that caught me off guard was that everyone prayed the trisagion prayers aloud together (not just the cantors), then all the people sang all the troparia to the healing saints that are in the beginning of the unction service. After a cell phone rang, the frustrated priest stopped the service, asked everyone to turn off their phones, waited for them to do so, then resumed the Gospel. The priest and cantor flew through the unction service in less than an hour. The people prayerfully stood for the whole six psalms, then everyone sang "God is the Lord" and the Apolytikion of Pentecost. By this point, there were no more seats and people were squeezing together, standing. 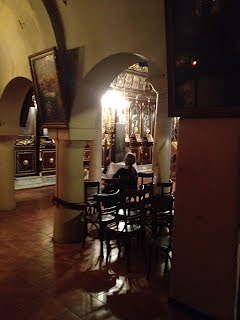 Several policemen entered the church, lit candles, kissed the icons, stayed for a few minutes, then left. During the canon, the priest came out to anoint the people with the oil of Holy Unction. There were no lines and or order, just a press to the front of the church, like sheep at pasture to drink from their shepherd. During the canon, I began to notice glimpses of the second priest behind the altar. Was he...? Yes he was vesting. There must be liturgy following Orthros. Ok...when was the last time I ate? Orthros concluded with the doxology sung by most of the people. By this point, there had to be at least two hundred people in this tiny space. The apolytikion of Pentecost, with gusto! The service of Artoklasia (blessed sweet bread) was performed, with three large loaves and two bushel baskets of bread cut into two-inch cubes. 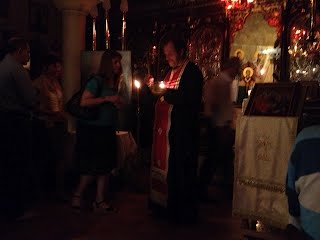 The liturgy began around 11pm. The cantors took the Kyrie eleisons during the Great Litany, but the people joined in for the antiphons and everything else until the Cherubic hymn. As many as could prostrated during the consecration. During the hymn to the Theotokos, the servers brought the priest several large baskets of bread (again, in large two inch cubes) for blessing. Then they brought at least five or six plastic grocery bags full of cubed bread. The non-serving priest interrupted the communion hymn with a homily. I could catch maybe half the words, a few phrases here and there. It was about the Trinity, one in essence, three in person. The serving priest came out with Holy Communion. The men pushed forward first (again, no line). A yiayia pushed me and said "Proti, proti (You first)." The women began communing, when the non-serving priest took the chalice to commune the women, while the serving priest entered the altar and finished the liturgy; the other priest continued to commune the faithful well after the liturgy concluded. The church was so full that the bread was placed on chairs in the middle of the street outside the front doors. The experience was incredible and overpowering. It was amazing to see the faith and devotion of these ordinary people packed into a tiny, old, dirty, unremarkable church in the middle of a Sunday night in a holiday weekend when many people leave town. I'm glad I will be living just behind this wonderful little church for another month. I will return. Beautiful description. I'm so glad you are there!